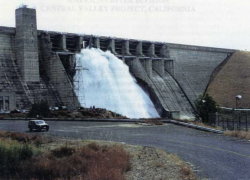 Located approximately 20 miles northeast of Sacramento, California, Folsom Dam was designed and constructed by the U.S. Army Corps of Engineers to generate hydropower along the American River. The 340-foot high concrete gravity Folsom Dam along with two earthen wing dikes on each of its sides create Folsom Lake. 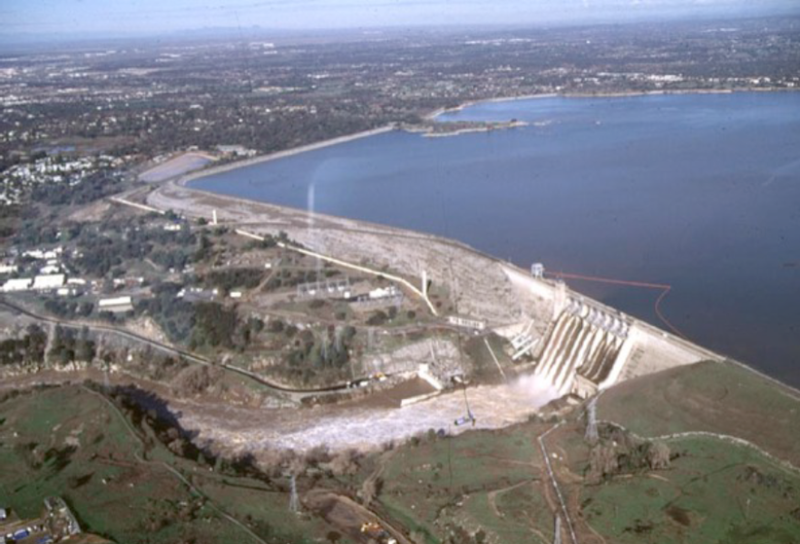 The spillway system at Folsom Dam allows the draining of Folsom Lake to maintain flow in the American River during routine maintenance and shutdowns at the power plant and in case of emergency. 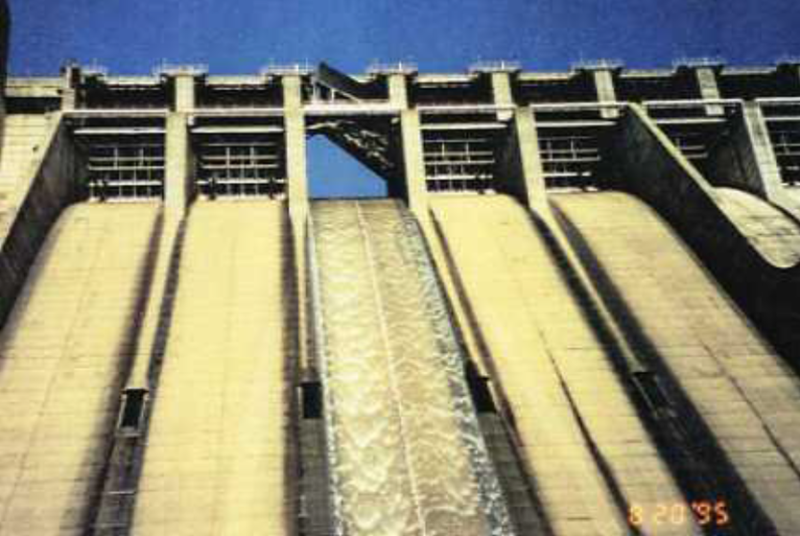 The spillway consists of eight 42-foot-wide bays equipped with five 50-foot-high radial service gates as well as three 53-foot-high radial emergency gates that release water from the reservoir. 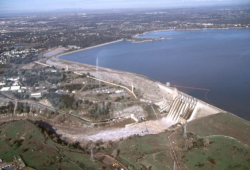 At the time of construction, which occurred between 1948 and 1956, Folsom Dam and Folsom Lake were part of a larger hydropower, irrigation, and water supply initiative called the Folsom Project. 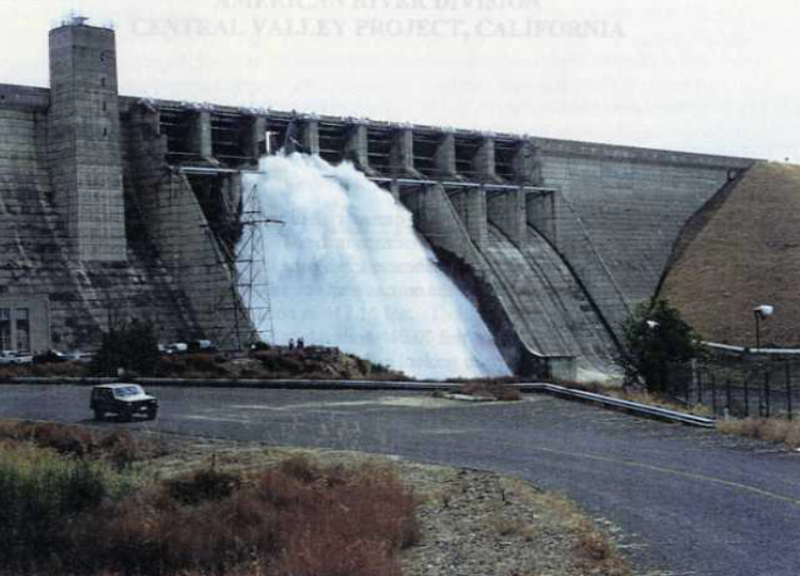 The Folsom Project also included the construction of a second dam approximately 7 miles downstream known as Nimbus Dam. 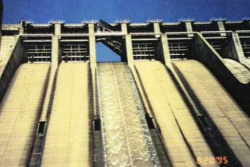 On July 17, 1995, when Folsom Lake was at full capacity, a Folsom Dam operator attempted to open Gate #3 to maintain the flow of the river during a scheduled power plant shutdown. 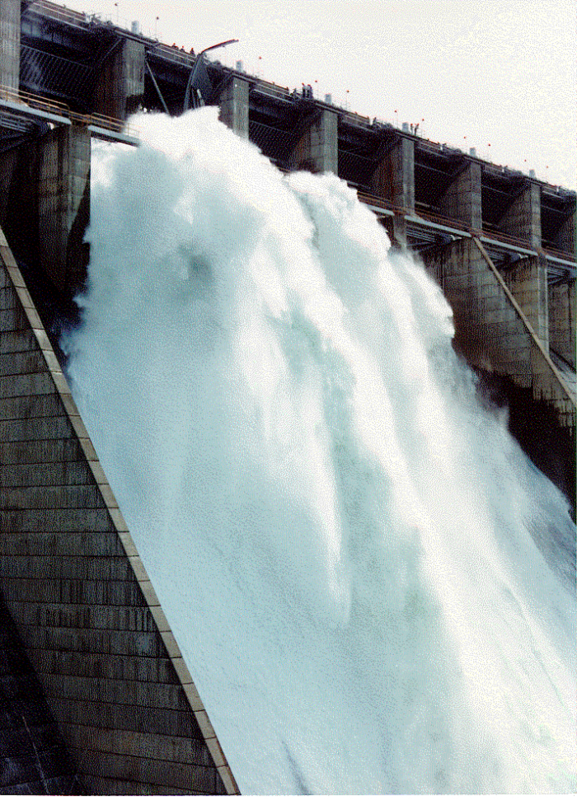 As the radial gate was raised water began flowing down the spillway chute as designed. It was not until the gate opening reached approximately 2.4 feet that the operator felt an “unusual vibration” accompanied by harsh grinding noises. No more than five seconds passed between the time the vibrations and sounds began and when the operator turned to look at the gate. The radial gate swung completely open releasing approximately 40,000 cfs. Nearly 40 percent of the storage in Folsom Lake was released past the broken gate before it could be repaired. 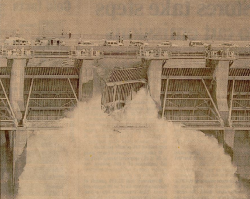 After immediately notifying dispatch of the gate failure, the Folsom Dam operator began the 7 mile drive downstream to Nimbus Dam where he assisted personnel at the site in properly positioning the spillway gates at this dam to account for the additional flow. 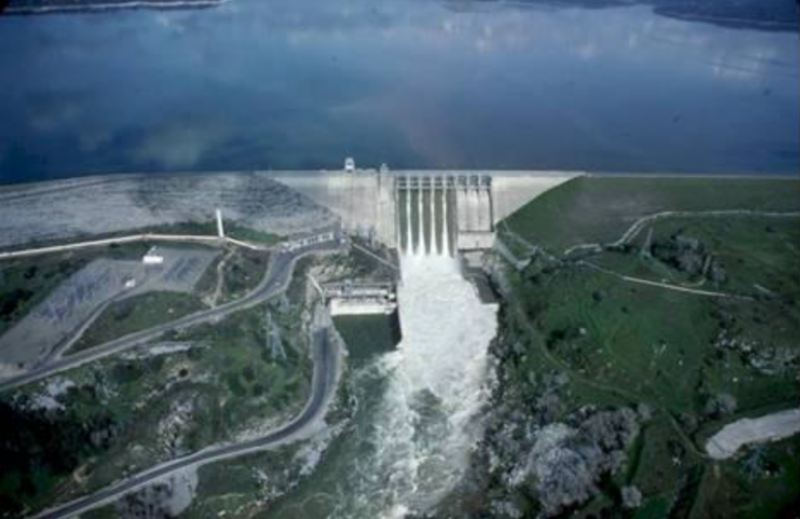 Due to the emergency action taken by the Folsom Dam operator when he noticed the failure of the gate, overtopping of Nimbus Dam was prevented and the water released from Folsom Lake was safely conveyed and attenuated. As a result, the consequences of the gate failure were limited to the damage to the gate and the loss of stored water. The gates were repaired at a cost of approximately $20 million. 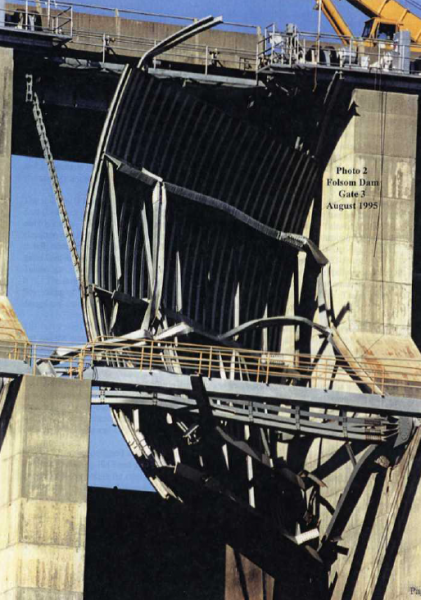 The forensic report documenting the failure of the Folsom Dam gate revealed the cause of the malfunction to be excessive friction at the 32-inch diameter trunnion pin, or pivoting mechanism. Unaccounted for in the gate design, this friction was caused by the corrosion of the pin over time. Due to the additional friction forces, the loads experienced by the trunnion pin caused increased loading in the gate struts and braces of the gate. The gate struts are primarily compression members, but friction at the pin-hub interface induced a bending stress during gate operation. 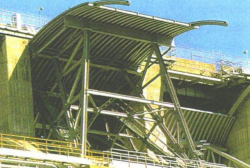 In order to better handle these loads, the struts are connected with diagonal braces that take the stress as axial loads. 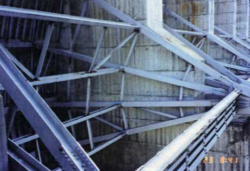 The resulting loads in these members exceeded the capacity of the strut-brace-connection bolts compromising the structural integrity of the gate. As the gate was operated, the failure initiated at a diagonal brace between the lowest and second lowest struts. Increasing corrosion at the pin-hub interface raised the coefficient of friction and, therefore, the bending stress in the strut and the axial force in the brace. The capacity of the brace connection was exceeded and it failed. This caused the load to redistribute and the failure progressed, eventually buckling the struts. Folsom Dam Gate #3 discharging approximately 40,000 cfs during failure. After a year-long investigation, the United States Bureau of Reclamation attributed the failure to a design flaw where the designers did not consider trunnion friction (at the pin-hub interface) in the gate analyses. While this is true, it was one of five identical service gates that operated under the same circumstances for nearly 40 years with no reported problems. This suggests that the failure resulted from a condition that changed over time; specifically, there was a gradual increase in the coefficient of friction at the pin-hub interface. The frequency of regular maintenance and lubrication over time was decreased. Weather and splash protection at the ends of the trunnion pin was not provided. Investigation into the failure of Folsom Dam Gate #3 also led to the discovery that the gate had not been opened more than 2 feet with greater than forty feet of head since 1958. Had the trunnion pin been maintained with appropriate lubricant, protected from weathering effects, and inspected on a routine basis, the gate failure may have been avoided. The operators of Folsom Dam have since implemented all of the aforementioned precautions and repaired the damaged Radial Gate #3 in an effort to ensure that such an event is not repeated. 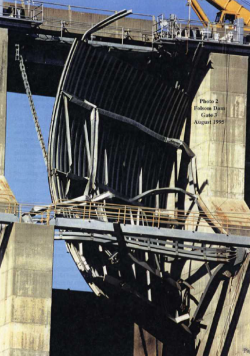 This failure caused no fatalities and it had a significant positive impact on the dam industry. A renewed focus was placed on maintenance and monitoring of radial gates, many of which were retrofitted to strengthen struts and bracing and ensure sufficient lubrication. 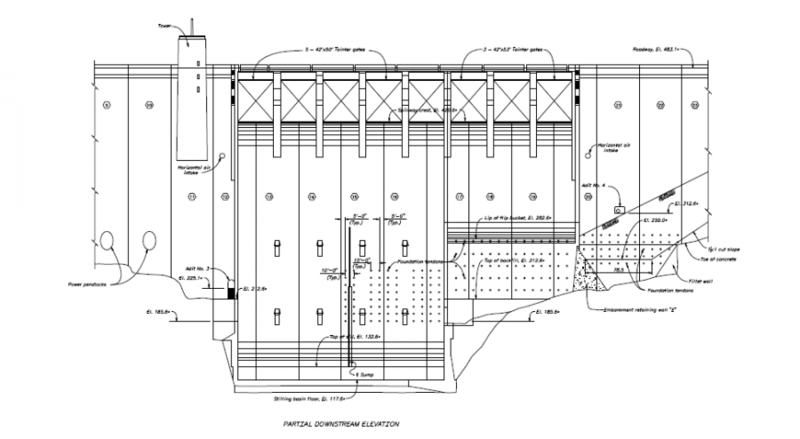 (1) Fiedler, W.R. Case Histories – Spillway Gates: Folsom Dam Radial Gates. 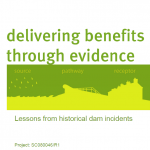 Dam Failures and Lessons Learned Seminar. Denver: Federal Emergency Management Agency. (2) Lindon, M., Lemieux, M., Baker, M., Sipe, J., & Sturdevant, B. (2010). Rapid Response to Emergencies. ASDSO Annual Conference. Seattle: Association of State Dam Safety Officials. (3) USBR & USACE. (2012). Spillway Gates. Best Practices in Dam and Levee Safety Risk Analysis Presentation Series. Denver: U.S. Department of Interior, Bureau of Reclamation. Elevation view from downstream of Folsom Dam and radial gate design. Tainter gate at Folsom Dam operating properly. Aerial view of Folsom Dam and Dike system that impounds Folsom Lake (Photo source: Richard E. Goodman, 2013 AEG Shlemon Specialty Conference). View from downstream of Folsom Dam spillway system during the failure of Tainter Gate #3 and discharge of 40,000 cfs flow. Folsom Dam Tainter Gate #3 during failure and release of approximately 400,000 acre-ft of the reservoir. View from bottom of spillway of damaged Tainter Gate #3 after Folsom Lake water level had lowered and discharge controlled. View from downstream of damage to Tainter Gate #3 after failure. Installation of a tainter gate similar to Radial Gate #3 at new auxiliary spillway of Folsom Dam. Video footage of Folsom Dam gate failure on July 17, 1995. Courtesy of the Bureau of Reclamation. Video editing by Mark E. Baker, National Park Service. 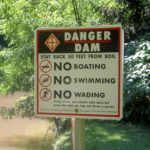 Dam owners, engineers and regulators need to address public safety at dams. 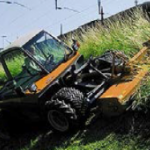 Hazardous hydraulic conditions, such as hydraulic rollers, can occur at dams of all sizes. Regular operation, maintenance, and inspection of dams is important to the early detection and prevention of dam failure. 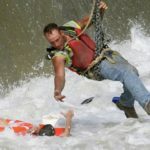 Warning time and rapid response is critical to saving lives during a dam failure emergency. Gates and other mechanical systems at dams need to be inspected and maintained.